iOS 8 is, by any measure, a big update. A lot of it is refinement to last year's drastic design overhaul, but there are also a lot of notable new features. Sitting amongst those refinements and big new features are little nuggets of delight in which Apple has designed or implemented something (whether it be a feature, design flourish or a shortcut) that you might not notice until one day you stumble upon it accidentally. Just like we have in the past few years, we like to find those little gems that come with every brand new version of iOS. 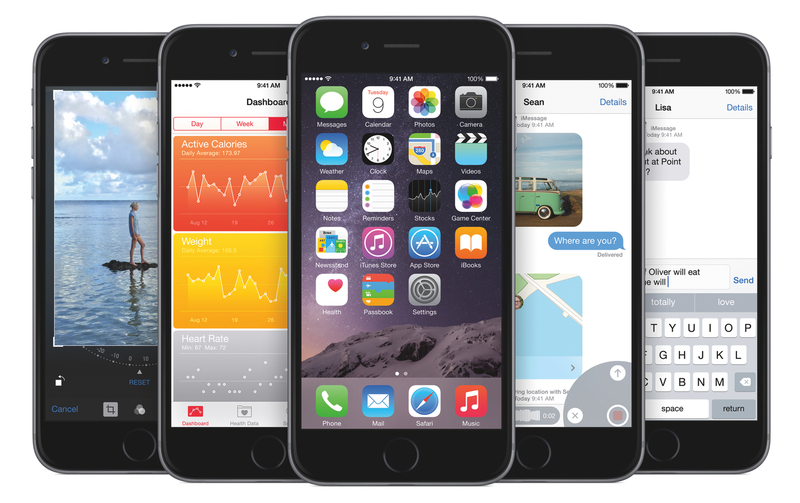 So in this post, you'll find dozens and dozens of tips, tricks, and details of iOS 8 that we've collected throughout the summer since the first beta release of iOS 8. 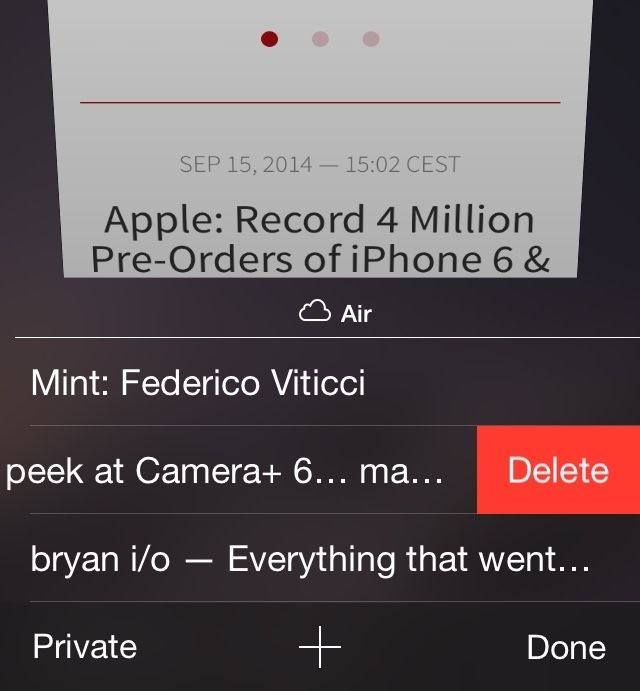 For more iOS 8 coverage, check out our news hub. 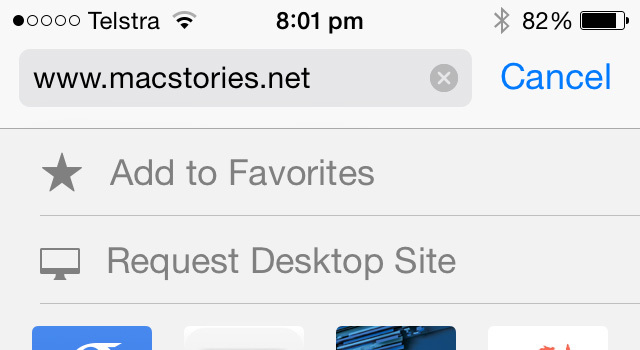 If you use Safari and iCloud Tabs, you can now swipe to close tabs from a different device. For example, you can close a tab open on your iPad from your iPhone. When you are on a website page, just tap the address bar, scroll down and there will be buttons to add the website to your favorites and a button to request the desktop site. DuckDuckGo can now be added as a search engine in Safari (from Settings > Safari). You can delete Frequently Visited websites (accessible by tapping the address bar) with a tap & hold, then Delete. If you tap & hold the bookmarks button in the Safari toolbar, you'll be able to quickly add the current webpage to your bookmarks or Shared Links. When installing betas from Hockey or TestFlight over-the-air, Safari no longer exits to the Home screen. When filling out credit card details in Safari, there'll be an option to “Scan Credit Card”. This feature allows your iPhone or iPad to take a picture of your credit card and automatically fill out the credit card number and name fields. Safari on iPad has a new tab view which can be accessed by tapping the top-right button or pinching in on any page. 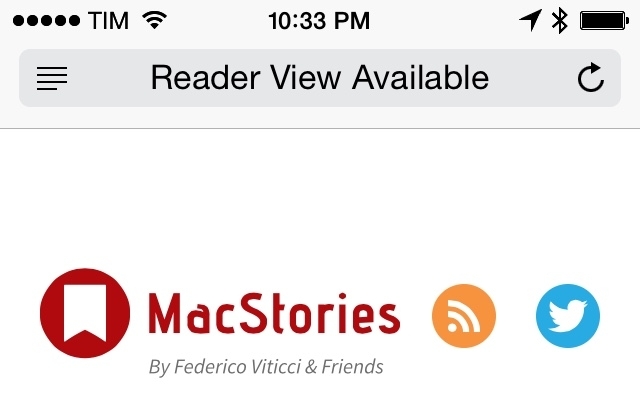 When you load a page and Safari can display it in the Reader View, a message to that effect will appear in the address bar and then disappear after a few seconds. If you tap and hold on a photo, you have the option to hide it. This will hide the photo from Moments, Collections, and Years, but it will still be visible in Albums. iCloud Photo Library (currently in beta) will initially store videos on your phone, but it will be removed after a period of time (unknown to us) and only be stored in iCloud. 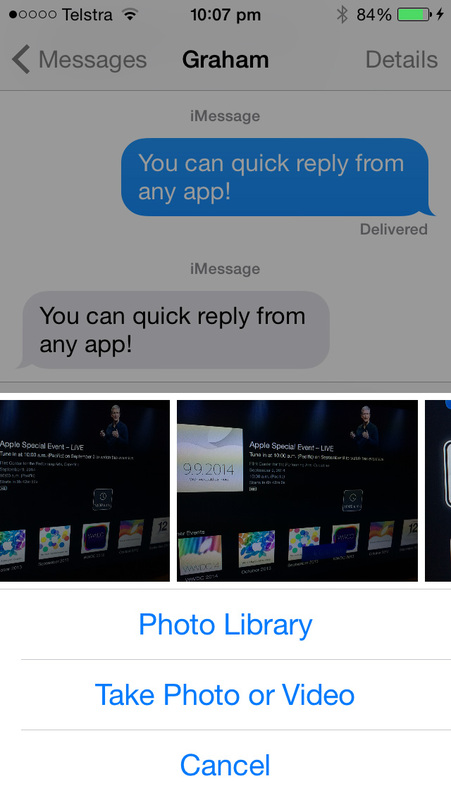 When you play videos in your library, it will stream it from iCloud. There is a download link which lets you store the video locally. When browsing your photos and videos, you'll notice that the date and time you took the picture/video is now displayed. There is a ”Recently deleted” album in Photos. You can manually adjust exposure in the Camera app by swiping up/down on the sun icon next to auto-focus. When adjusting your screen brightness in Control Center, the screen will temporarily remove the dimmed background that Control Center causes. What this means is that as you move the brightness slider, it will accurately change the brightness on the screen. 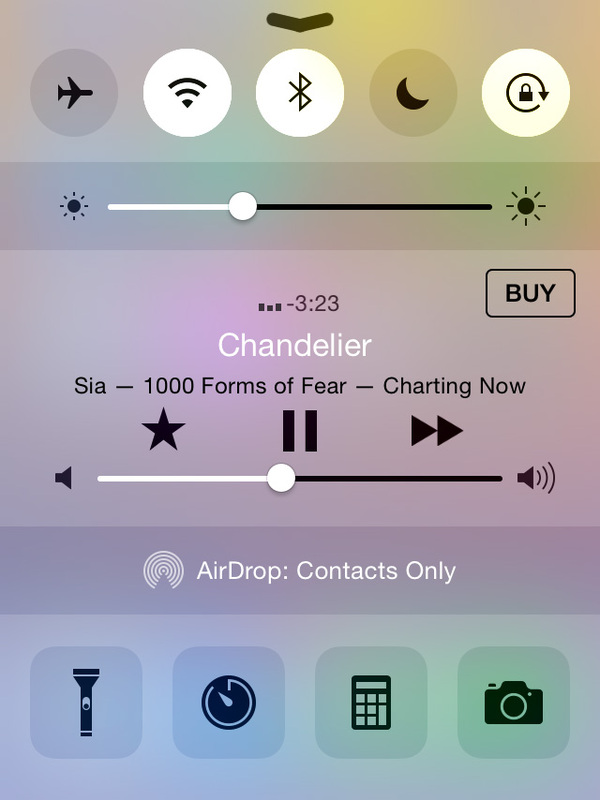 Control Center will display a Buy button when you are playing iTunes Radio. You can now remove individual notifications (rather than removing all notifications from an app) by swiping left. 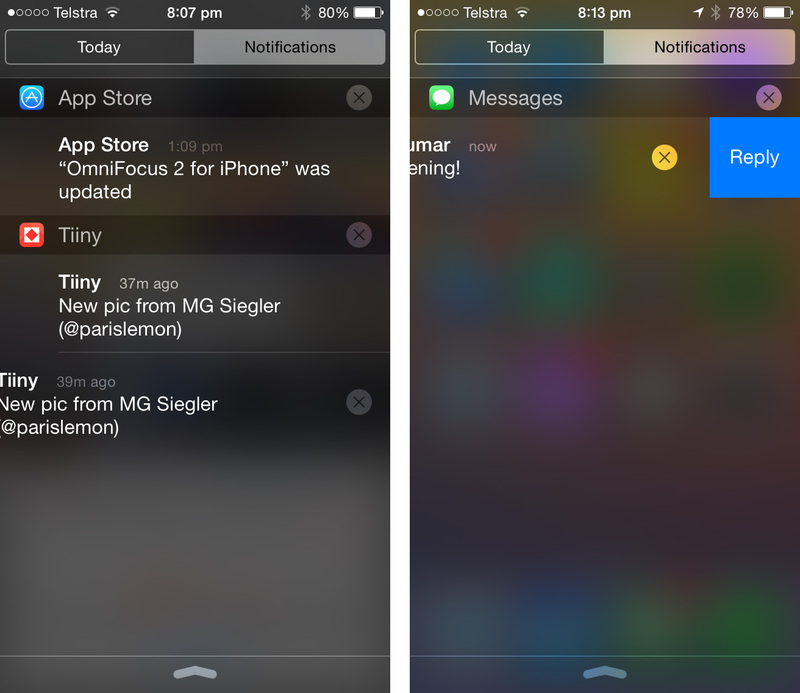 In Notification Center you can reply to a message simply by swiping left. 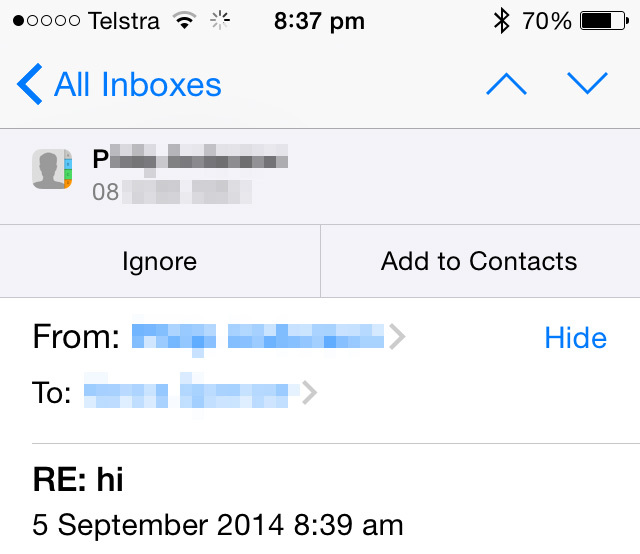 Apps that have interactions will also display extra buttons when swiping (such as Mail). In a similar vein, you can quick reply to a message by pulling down on the notification bar, QuickType will even adjust to show basic canned reply messages. This lets you reply to a message even when you are in another app. 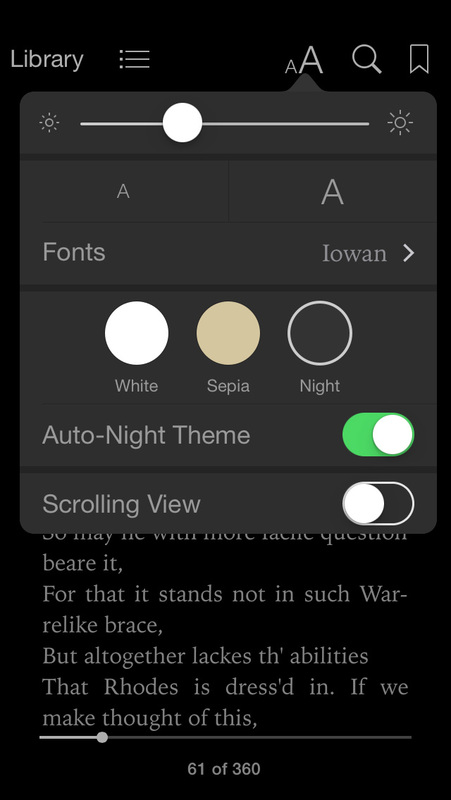 There is an Auto-Night Theme in iBooks. iBooks can now be categorized into series. 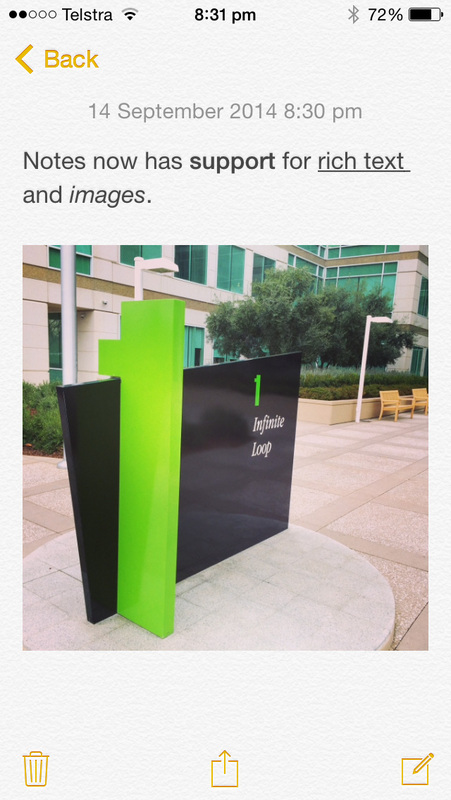 Notes now has support for rich text and inserting images, which will sync over iCloud to all your devices. You can set notification alerts for individual message threads. 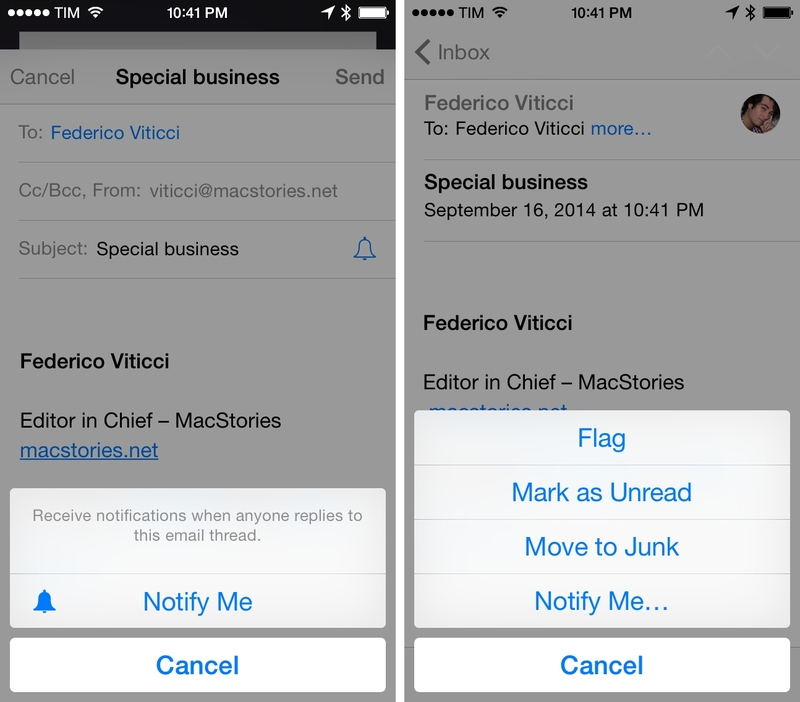 Simply tap the bell icon when composing a message (it only appears when editing the subject line), or press the Flag icon and press 'Notify Me...' for existing messages. There is support for Exchange automatic reply. When you get an email from a person that isn't in your Contacts it will prompt you to add them with a little banner at the top that cleverly draws on information contained in email signatures. You can swipe left on a message to show three buttons to flag, move, and delete. If you keep swiping, the delete button will be activated and the message will be discarded. In Settings, you can change Mail's Swipe Options for swipe left and right. You can decline a calendar invite with a comment. You can turn on Calendar week numbers by going to Settings > Mail, Contacts, Calendars > Week Numbers. You can choose to get notification alerts based on when you need to leave for Calendar events. You can show more or less hours in the Calendar day view by pinching in and out. 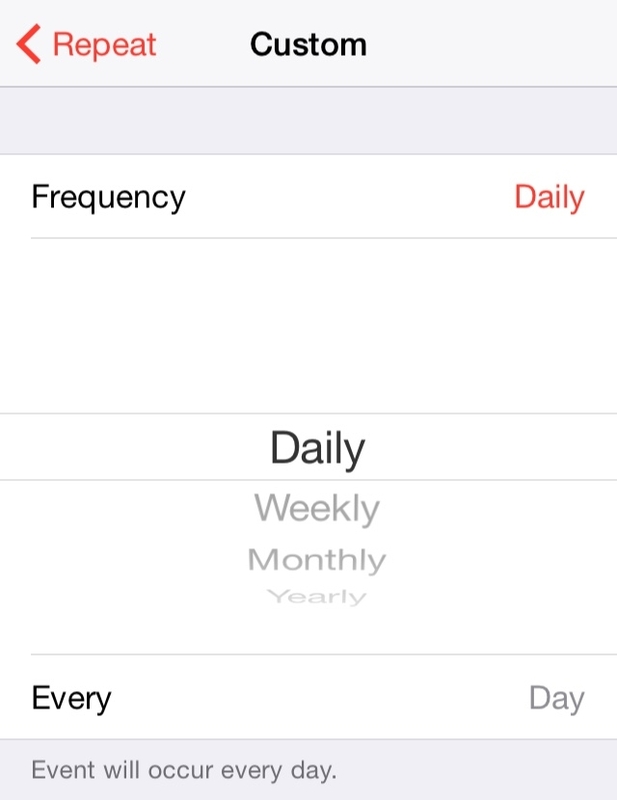 Custom repeat settings are now available in the Calendar app. There's a new option for Travel Time in Calendar events. You can hide QuickType by swiping down in its vicinity. Keyboard touches are ignored while swiping up to access Control Center. For those apps which haven't been updated for iOS 7+, the iOS 6 keyboard is automatically replaced by the iOS 7+ version. You can open and use the Phone app during a call. The Phone app remembers if the speaker was turned on during last call. If you make a phone call to a business by initiating a call from a Maps entry, the Phone app will automatically pull their name and use it to display the company name in the Recent Calls list - even if you don't have their number saved as a contact. Pressing the camera button in Messages shows recently taken pictures. Pictures in Messages conversations are much larger than in iOS 7. 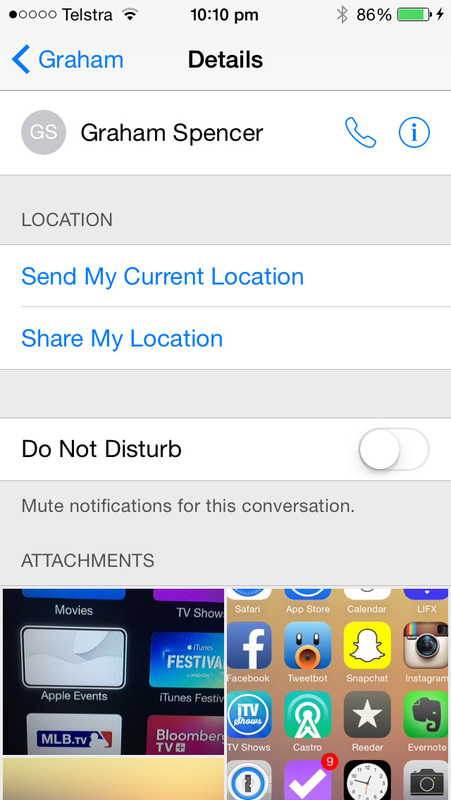 You can send your current location in Messages. When you are in a message thread with someone you just need to tap the 'Details' button and you can choose between sending your current location or sharing your location for an hour, day or indefinitely. You can delete message attachments (tap and hold, then follow the prompts). Raise to Listen/Talk is supported for audio clips shared in the Messages app. 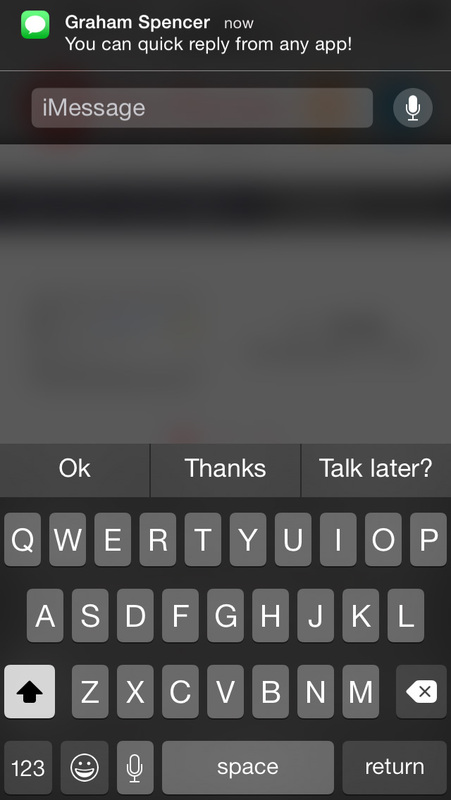 The Messages app now auto-loads previous messages when scrolling back in a conversation. 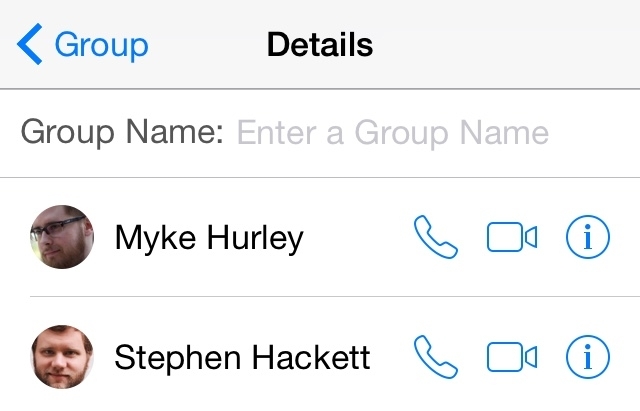 You can title group message threads. Just go to 'Details', scroll down and there'll be a field for a group name. If you've started writing a quick reply and want to go to the full Messages app without losing what you've typed, tap the notification banner while in quick reply and your text will be carried over. If you swipe left on an album you can delete it. On the iPad Music app, Albums will no longer show tracks until you tap into that album. You can now add music to a playlist from another playlist. When in the multitasking view on iOS you'll now see a row of recent contacts, but swipe right and you'll see your list of Favorite contacts. 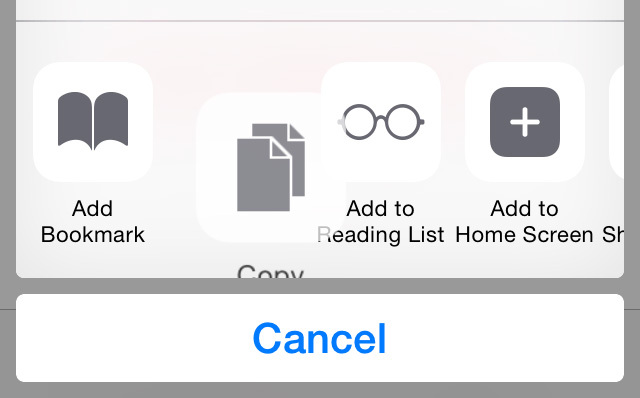 You can choose to show or hide contacts in the app switcher from Settings > Show In App Switcher. There is Play/Pause button next to the record button in Voice Memos. The previous Spotlight search term is highlighted, so you can immediately start typing and it will clear the existing search. There are different and more detailed options and settings for Location, Privacy and Touch ID. There is an option to ”Send Last Location” in Find My iPhone. 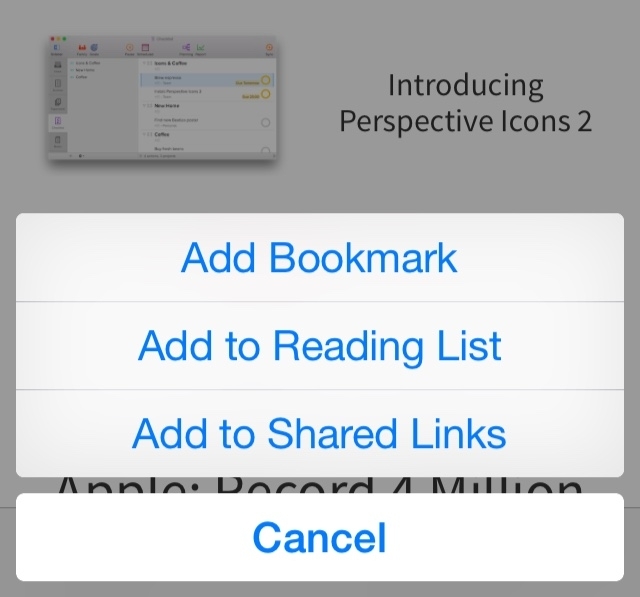 You can customize share sheets by moving the options around. Just like the Home Screen, you tap and hold to move them around. There is a new animation when you open an app from the lock screen. 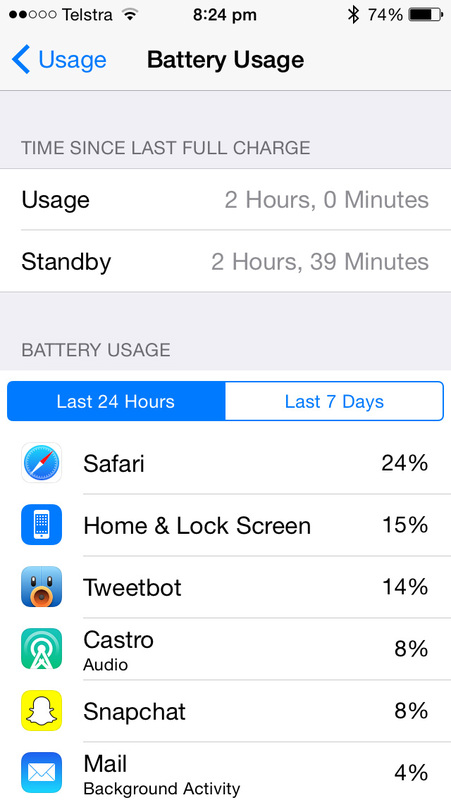 You can now see battery usage on a per app basis for the last 24 hours or last 7 days. Go to Settings > General > Usage > Battery Usage. Just as we mentioned earlier with respect to Notification Center, you also have greater control over notifications on the Lock Screen in iOS 8. 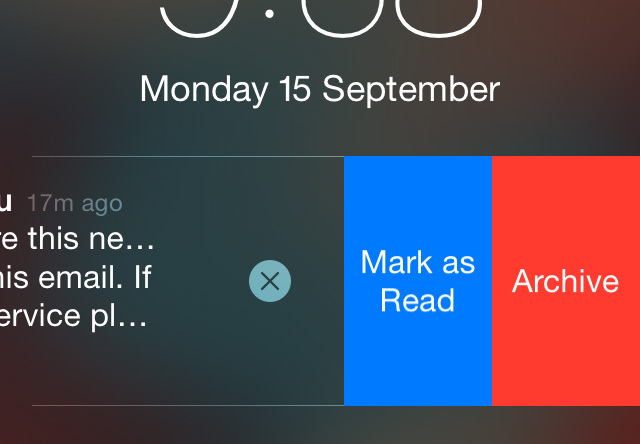 For example for Mail messages you can mark an email as read or even archive it directly from the Lock Screen. 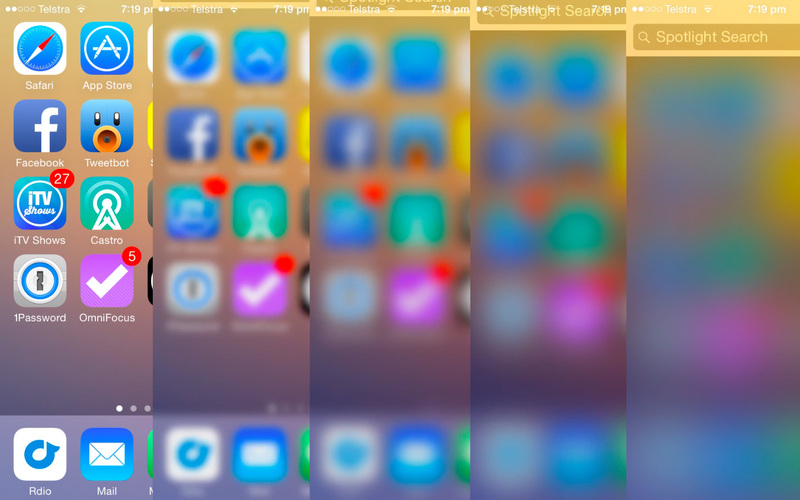 The animation for opening Spotlight makes the iOS Home Screen blur gradually. As the Spotlight bar gets closer to being displayed, the more the background is blurred. Per-app settings have been redesigned to include a single Allow Notifications toggle and shortcuts to Privacy, Background App Refresh, and Use Cellular Data.